Calcium Chloride, CaCl2, chemical compound that is crystalline, lumpy, or flaky, is usually white, and is very soluble in water. A white deliquescent compound, Calcium Chloride, CaCl2, which is soluble in water; m.p. 782°C. There are a number of hydrated forms, including the monohydrate, CaCl2.H2O, the dihydrate, CaCl2.2H2O (r.d. 0.84), and the hexahydrate, CaCl2.6H2O. The hexahydrate loses 4H2O at >30°C and the remaining 2H2O at 200°C). Large quantities of it are formed as a byproduct of the Solvays Process or other manufacturing activities and it can be prepared by dissolving calcium carbonate or calcium oxide in hydrochloric acid. Solid calcium chloride is used in mines and on roads to reduce dust problems, whilst the molten salt is the electrolyte in the extraction of calcium. An aqueous solution of calcium chloride is used in refrigeration plants. Calcium Chloride, CaCl2, is hygroscopic; it rapidly absorbs water and is used to dry gases by passing them through it. Calcium chloride is commercially available usually as the dihydrate, CaCl2·2H2O; it is used to melt ice on roads, to control dust, in brines for refrigeration, and as a preservative in foods. It is also used in the monohydrate and hexahydrate forms. Dry Basis Assay 98% min. It is important for the user of Calcium Chloride fused to understand the difference between Calcium Chloride Dihydrate Crystals and Calcium Chloride Fused. First stage at which manufactured Calcium Chloride, CaCl2 is available is of Calcium Chloride Solution say of 30-35%.. On further evaporation it can be converted to Dihydrate Calcium Chloride Crystals or Calcium Chloride Fused. Calcium Chloride Dihydrate is having a melting point of 176C or there about at normal pressure. To get Dihydrate Crystals CaCl2.2H2O, one must evaporate Calcium Chloride in a vacuum evaporator maintaining temperatures of about 100C. Temperature control is important to avoid formation of Calcium Chloride Tetrahydrate. Calcium Chloride Dihydrate crystals are separated from the mother liquor by high speed centrifuges and surface dried. Hexahydrate Calcium Chloride is having a melting point of 29C or there about at normal pressure. To get Calcium Chloride Hexahydrate Crystals, one must evaporate Calcium Chloride in a vacuum evaporator maintaining temperatures of about 100C during evaporation and then quickly chilling the mass. Temperature control is important to avoid formation of Calcium Chloride Tetrahydrate. Calcium Chloride Hexahydrate crystals are separated from the mother liquor by high speed centrifuges and surface dried. We also offer Calcium Chloride USP BP FCC Food Grade from a world class FDA approved, ISO-9001-2008, ISO-22000-2005 HACCP Certified facility with Kosher & Halal approval. It is extensively used in oil well drilling, fracturing or fracking. Assay: Calcium Chloride contains an amount of CaCl2 equivalent to not less than 99.0 percent and not more than 107.0 percent of CaCl2·2H2O. Labeling: Where Calcium Chloride is intended for use in hem dialysis, it is so labeled. Identification: A solution (1 in 10) responds to the tests for Calcium and for Chloride. pH: between 4.5 and 9.2, in a solution (1 in 20). Aluminum (where it is labeled as intended for use in hem dialysis): the limit is 1 4g per g.
Iron, aluminum, and phosphate: To a solution (1 in 20) add 2 drops of 3 N hydrochloric acid and 1 drop of phenolphthalein TS. Then add ammonium chloride–ammonium hydroxide TS, drop wise, until the solution is faintly pink, add 2 drops in excess, and heat the liquid to boiling: no turbidity or precipitate is produced. Limit of magnesium and alkali salts: Dissolve 1 g in about 50 mL of water, add 500 mg of ammonium chloride, and proceed as directed in the test for Limit of magnesium and alkali salts under Calcium Carbonate, beginning with “heat the solution, and boil for 1 minute”: the weight of the residue does not exceed 5 mg (1.0%). Organic volatile impurities meets the requirements. Content: 97.0 per cent to 103.0 per cent of CaCl2,2H2O. Appearance: White or almost white, crystalline powder, hygroscopic. Solution S (see Tests) gives reaction of chlorides. It gives the reactions of calcium. It complies with the limits of the assay. Appearance of solution: Solution S is clear and not more intensely colored than reference solution. Acidity or alkalinity: To 10 ml of freshly prepared solution S add 0.1 ml of phenolphthalein solution. If the solution is red, not more than 0.2 ml of 0.01 M hydrochloric acid is required to discharge the color and if the solution is colorless, not more than 0.2 ml of 0.01 M sodium hydroxide is required to turn it red. Aluminium: To 10 ml of solution S add 2 ml of ammonium chloride solution R and 1 ml of dilute ammonia and boil the solution. No turbidity or precipitate is formed. If intended for use in the manufacture of dialysis solutions, the above test is replaced by the test for Aluminium maximum 1 ppm. Barium: To 10 ml of solution S add 1 ml of calcium Sulphate solution R. After at least 15 min, any opalescence in the solution is not more intense than that in a mixture of 1 ml of distilled water and 10 ml of solution S.
Iron: Maximum 10 ppm, determined on solution S.
Magnesium and alkali metals: Maximum 0.5 per cent. Content: 97.0 per cent to 103.0 per cent of CaCl2,6H2O. 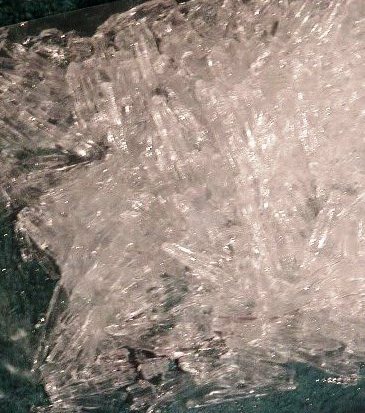 Appearance: White or almost white, crystalline mass or colorless crystals. It solidifies at about 29C. Solution S: Dissolve 15.0 g in carbon dioxide-free water prepared from distilled water R and dilute to 100 ml with the same solvent. Aluminium: To 10 ml of solution S add 2 ml of ammonium chloride solution R and 1 ml of dilute ammonia R1 . Heat to boiling. No turbidity or precipitate is formed. If intended for use in the manufacture of dialysis solutions, the above test is replaced by the test for Aluminium : maximum 1 ppm. Barium: To 10 ml of solution S add 1 ml of calcium Sulphate solution. After at least 15 min, any opalescence in the solution is not more intense than that in a mixture of 1 ml of distilled water and 10 ml of solution S.
Iron: Maximum 7 ppm, determined on solution S.
Magnesium and alkali metals: Maximum 0.3 per cent. Heavy metals Maximum 15 ppm. Calcium Chloride occurs as white, hard fragments, granules, or powder. It is anhydrous or contains two molecules of water of hydration. It is deliquescent. It is soluble in water and slightly soluble in alcohol. The pH of a 1:20 aqueous solution is between 4.5 and 11.0. Labeling: Indicate whether it is anhydrous or the dihydrate. Identification: A 1:10 aqueous solution gives positive tests for Calcium and for Chloride. Assay: Anhydrous: Not less than 93.0% and not more than 100.5% of CaCl2; Dihydrate: Not less than 99.0% and not more than 107.0% of CaCl2·2H2O. Acid-Insoluble Matter Anhydrous: Not more than 0.02%; no particles per kilogram of sample greater than 2 mm in any dimension. Fluoride: Not more than 0.004%. Magnesium and Alkali Salts Anhydrous: Not more than 5.0%; Dihydrate: Not more than 4.0%. Calcium Chloride Solution occurs as a clear to slightly turbid, colorless or slightly colored liquid at room temperature. It is normally available in a concentration range of about 35% to 45% of CaCl2. Identification: When diluted to a concentration of about 1:10 (CaCl2 basis), a sample gives positive tests for Calcium and for Chloride. Assay: Not less than 90.0% and not more than 110.0%, by weight, of the labeled amount of calcium chloride, expressed as CaCl2. Alkalinity [as Ca(OH)2]: Not more than 0.3%. Fluoride: Not more than 0.004%, calculated on the amount of CaCl2 as determined in the Assay. Lead: Not more than 4 mg/kg, calculated on the amount of CaCl2 as determined in the Assay. Magnesium and Alkali Salts: Not more than 5.0%, calculated on the amount of Calcium Chloride as determined in the Assay.